I know a great many photographers who work very hard at their craft. Just hauling all the equipment needed for a professional photo shoot is a lot of work. By the time it’s all wrapped up at the end of the day, a shower is really needed. Interestingly, there is a new shower item on the market now that will come in handy for the active traveler. Invented by an avid cyclist, there is finally a product that helps you clean up when there’s either no water around or time doesn’t permit a shower. 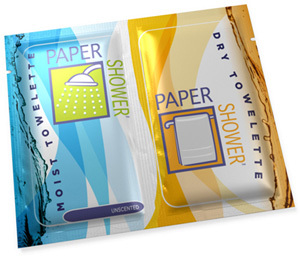 Paper Shower is a combination of a separate moist towel and a dry towel, conveniently packed in individual, tear-open foil packs that are small enough to fit into your shirt pocket. I know people who’ve tried to use moist towelettes intended for cleaning your hands after a messy meal, but these are so small and so highly scented that you end up smelling like a lemon. Even more importantly, they aren’t big enough for a whole body wash, and the sticky feeling stays on your skin. Enter the Paper Shower. Tearing open the separate sleeves for the moist and dry towels, I was immediately impressed with the size of the towels. These were bigger than a standard size wash cloth you get in a hotel. And durable. These things don’t fall apart at all. Scrubbing…rubbing…doesn’t matter – they hold together. And the dry towel – same deal, nice and sturdy, but soft and absorbent. It’s hard to say that many things are unscented, but these come as close as possible to that description. No smelly odors to deal with - just a nice moist towel that can be used whenever the need arises. And no messy, slimy, after-effects once you’ve finished. Priced very economically, there’s no reason to not pack a few of these in your bike bag, your tennis bag as well as your camera bag. You’ll be glad you did. Check out their website to order.